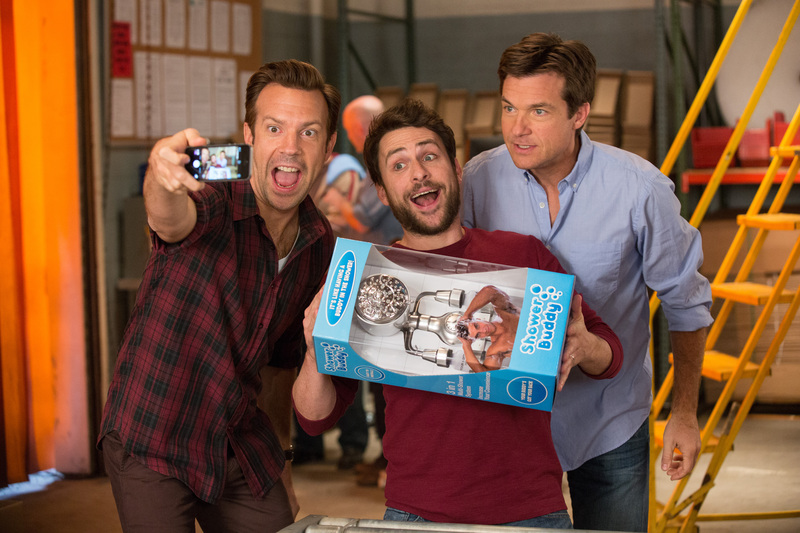 As far as comedy sequels go, “Horrible Bosses 2” gives you lots more of what you liked in the first film. Horrible Bosses 2 brings back together just about all the elements that made 2011’s Horrible Bosses such a hilarious romp in order to hopefully strike box office gold again, and surprisingly, it almost works. Yes, it doesn’t have as much bite as its predecessor, and because the crime the film’s trio of likeable schlubs hope to perpetrate isn’t quite as heinous, the film’s tone comes off as lighter and goofier. But the chemistry of the cast and the return of the first film’s most memorable supporting characters provides lots of naughty giggles and should help audiences forgive quite a bit in terms of plot silliness. Tired of being worker bees toiling away upon the orders of others, our would-be criminals from the first film — Nick (Jason Bateman), Dale (Charlie Day), and Kurt (Jason Sudeikis) — decide to go into business for themselves and be their own bosses. Having conceived and prototyped what they hope will be the next “As Seen on TV” hit invention, they find themselves courted by father and son corporate magnates Burt and Rex Hanson (Christoph Waltz and Chris Pine, respectively), who make the boys an offer in terms of an initial order that seems too good to be true, and turns out to be exactly that. Outsmarted and on the hook for hundreds of thousands of dollars in startup costs and payroll, the trio that once plotted to murder their horrible bosses find themselves turning to crime once again to potentially solve their problems. The plan? Kidnap Rex and ransom him back to his father for the money they were promised. Simple, right? Well, perhaps it might be simple for a brilliant psychopath like Nick’s former boss David Harken (Kevin Spacey), now sitting in prison and still finding ways to make Nick’s life miserable, or for Dean “Motherf—r” Jones (Jamie Foxx), their erstwhile murder consultant, still willing to dole out crime advice for a very negotiable fee, or even for Dale’s oversexed, potty-mouthed dentist boss Julia (Jennifer Aniston), still out to get her hands on Dale’s boy parts any way she can. But Nick, Dale, and Kurt? If they were capable of pulling off this sort of thing, then the movie wouldn’t be much of a comedy, would it? Three summers ago, the original Horrible Bosses made its mark as one of the most successful black comedies in Hollywood history, practically making back its modest budget in its opening weekend and going on to gross over $200 million worldwide. Moviegoers loved it and critics applauded it mainly due to how well it was cast and just how gleefully wicked and nasty it got in order to get a laugh. This new film, in comparison, feels like its pulling its punches in terms of the main plot and the gags that come with it. Part of that lack of edge is certainly due to the fact that the crime is kidnapping rather than outright murder, but also the motivation the guys have for perpetrating the crime comes from a different place emotionally than the first time around. That time they were acting out of years of abuse and harassment. This time they’re just miffed because they got swindled. Believe it or not, that lack of conviction makes a difference in terms of just how well the movie hits home, comedy or not. What the film does have going for it is that stellar cast, who once again each show off their mastery of comic timing and their chemistry with one another. Fueled by a script loaded with just as much potentially offensive material as the first time around, Bateman, Day, Sudeikis and company make their every scene together look and sound like they’ve been riffing off each other for years. Chris Pine gets to show off his comedic chops along with the always-mesmerizing Waltz (come on: he was even good in The Green Hornet! ), plus comedy fans get a special treat this time around in Bateman’s trademark deadpan schtick taking on Aniston’s lascivious Julia (the two shared no scenes together in the first Bosses), leading to one of the film’s funniest exchanges during, of all things, Julia’s weekly sexual addiction group therapy meeting. Priceless stuff. All in all, Horrible Bosses 2 is a perfectly serviceable black comedy to help you blow off some steam this Black Friday weekend, particularly if you plan to be out dealing with horrible lines in horrible stores filled with horrible customer service and horrible people. Chances are after all that you’ll want to kill someone in the metaphorical sense, so you’ll be in need of a good mean-spirited laugh. It may not have as many as its predecessor, but Horrible Bosses 2 still has plenty of those. Starring Jason Bateman, Charlie Day, Jason Sudeikis, Jennifer Aniston, Jamie Foxx, Chris Pine and Christoph Waltz. Directed by Sean Anders. Rated R for strong crude sexual content and language throughout.